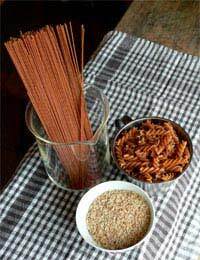 Complex carbohydrates are rich in vitamins, minerals, protein and fibre. Simple carbohydrates like white bread and white flour are not loaded with fat but they are lacking in nutrients, often leaving you with hunger pangs an hour after eating. Wholewheat breads, wholewheat pasta and brown rice make for very healthy eating and are excellent sources of slowly digested, fibre-filled complex carbohydrates. High fibre foods fill you up with fewer calories and alleviate your hunger because they are metabolised slowly, leaving you feeling satisfied for longer. High fibre foods also keep you from absorbing some of the calories in other foods. It is not difficult to work high fibre foods into your diet - fruits, vegetables, dried beans, cereals and wholegrain breads have plenty. The best way to be satisfied with your meals is to eat a variety of these flavours, colours and textures. Slow down and enjoy what you are eating. Pasta is filling, low in fat, packed with energy-producing complex carbohydrates and generally cholesterol-free. It is also a good source of B vitamins. It’s a great deal of nutrition for about 200 calories a serving, as long as you don’t include high calorie sauces in your recipes. Stick to low calorie meatless tomato sauces, rather than creamy ones. If you want to have cheese with your pasta make sure it is just a dusting of intensely flavoured Parmesan or some other cheese which will mean using just a small amount. There are excellent reduced fat cheeses you could try. Stir pureed red peppers into a basic tomato sauce, adding hardly any calories. Mix heated marinara sauce with pureed low-fat cottage cheese. You’ll get the creaminess without a lot of calories. Puree cooked vegetables with enough stock to make a light sauce. Season with herbs and toss with cooked pasta. Top with a sprinkling of Parmesan. Potatoes are a nutritional bargain. For about 150 calories, a baked white potato contributes complex carbohydrates and fibre, provides more potassium than a medium banana and one-third of our daily requirements for vitamin C. You can have all of that for zero fat and cholesterol. Make a meal out of a potato. Scoop the flesh out of one large baked potato, leaving the skin shell. Mix with half a cup of low-fat cottage cheese and half a cup of chopped, steamed vegetables and fresh dried herbs. Spoon into the potato skin and sprinkle with one tablespoon of reduced-fat cheddar cheese. Heat in the oven or microwave until the cheese melts. For great low-fat mashed potatoes add one or two peeled garlic cloves to the pot when cooking the potatoes. Mash the garlic along with the potatoes. Leave out the butter or margarine and replace it with buttery-tasting low-fat buttermilk. Sweet potatoes are comparable in the nutrition they provide, with the added bonus of beta-carotene. Beta carotene is converted into vitamin A by the body and is considered a powerful weapon in fighting off diseases like cancer. As brown rice is unpolished, the bran layer is left intact. It is more filling and nutritious than white varieties because of the vitamins and fibre contained in the rice husk. It sometimes takes longer to cook. A nutritious salad, this recipe combines brown rice with the tart, tangy taste of apricots. Cook the rice according to instructions on the packet and mix the dressing ingredients together.Drain the rice and turn into a bowl. Add the dressing, mix well and leave to cool for 1 hour.Halve and deseed the pepper and cut into 50mm strips. Roughly chop the apricots and dice the cucumber into 15mm cubes. Mix the peppers, apricots, cucumber and pumpkin seeds with the rice. Season to taste and garnish. You don’t have to be vegetarian to enjoy this low calorie, high fibre dish. Saute the onion gently in the oil for 2 to 3 minutes until soft but not browned. Add the Quorn pieces, chilli beans in their sauce, and the chopped tomatoes and bring to the boil. Lower the heat and simmer gently for 15-20 minutes. Season to taste with salt and pepper and add coriander before serving if liked. Serve with boiled brown rice.